The second Nintendo DS carrying case we're looking at is the "DS Airform Carrying Case". This case design has a hard outer plastic shell and is available to fit both the Nintendo DS and the DS Lite. It is available in both pink and blue. 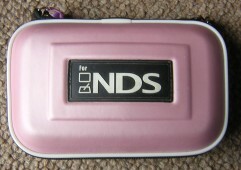 The DS Airform Carrying Case – Made to keep your DS safe and sound. Like the DS itself, this case is a "clam shell" design, meaning that it folds together when it is not in use and folds out when it is open. Just like a clam shell opening to reveal a pearl, only this time the pearl is your precious console. The hard plastic exterior should protect your console from most minor bumps and shunts. The two halves of the case will stay securely closed thanks to a sturdy zip fastening. We particularly liked the accessory holders in the case. As you can see in the picture below, there's room for six game cards in dedicated game card holders. 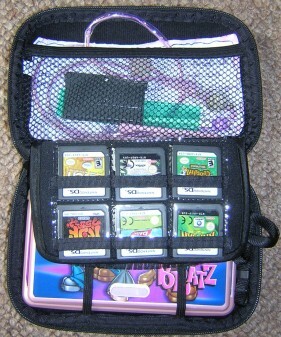 There's also a net bag which can store other accessories, such as headphones or a spare stylus. Dedicated game holders - Hurrah! The dedicated game card holders make it quick and easy to find the game you want when you are on the road. You can also attach a shoulder strap to the case if necessary. The cases hard plastic exterior should keep the console and its accessories safe from bumps and shunts as you travel. 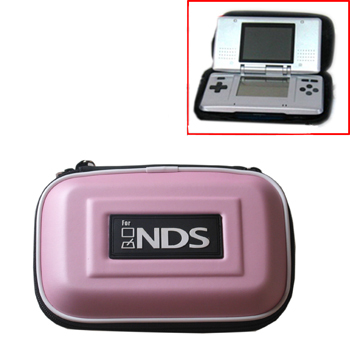 Overall this is an ideal DS carrying case for storing or travelling with your DS. A great case to pop in your hand luggage for those boring long flights. There isn't quite as much room in this case as in some other cases however, also there's no pocket for storing your DS charger.